From Santa Claus to reindeer to angels to Christmas music, a national website ranks the best Christmas lights for every state. The Daily Meal takes the best Christmas lights displays from all over the nation and ranks the best ones state-by-state. You’ll want to head down to Brooklyn for New York’s greatest. According to the Daily Meal, the Dyker Heights Christmas lights competition truly dazzles all visitors. See a gallery of the displays below. Keith Shaw’s Christmas Spectacular in Cranbury is don’t miss it type of display, according to the Daily Meal. Shaw’s 36-foot-tall Christmas tree features more than 50,000 lights. That’s not all, however. 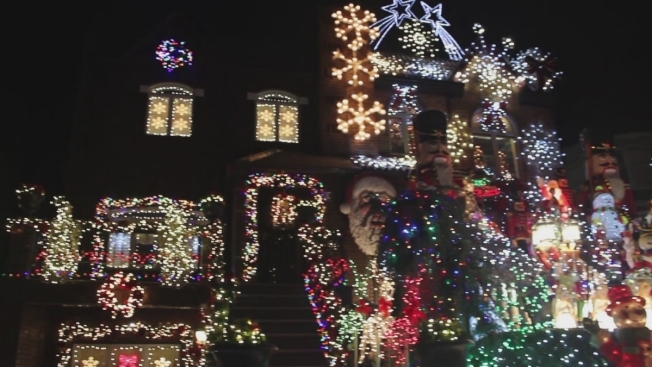 Each show includes more than 100,000 lights and music all in his front yard. Goodwin Park’s Holiday Light Fantasia in Hartford is ranked the top display for the Nutmeg State. Christmas, Hanukkah and New Year’s Eve are represented in the light show, the Daily Meal reports. The two-mile show includes more than one million lights and even features a “Where’s Waldo” display for visitors to attempt to find the hidden puppy wearing a Santa hat.